Hope everyone is surviving whatever kind of weather you're getting. Today I was asked to be Guest Designer at Quirky Crafts Challenge Blog and of course, I accepted. 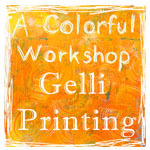 This is my second Guest Spot at their very fun challenge blog. Not only do you get to enter the challenge, but you also get to go back on Friday after you've entered and vote for you favorite entry. They always have great prizes. This week the generous sponsor is Stitchy Bear Digistamps Store . You will find tons of variety at their shop. 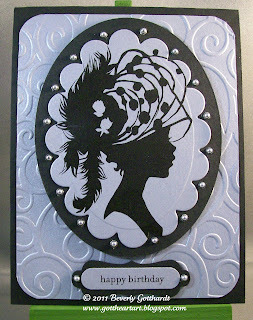 The pretty Hat Silhouette-Feather Flourish digi is one of their generous gifts to the Design Team and Guest Designers. You need to hop over and see what the other Design Team members did with their choices, lots of great inspiration. My fellow Guest Designer used the same digi I did, but she dolled her's up much more than I did. I printed the digi and the sentiment on SU Brushed Silver card stock and heat set the ink so I wouldn't get smears. I ran the main mat of Brushed Silver through the D'Vine Swirls Cuttlebug embossing folder and corner rounded the corners. I then positioned a Nellie Snellen Multi Frame die over the digi and cut her out, attached her to a large black oval and attached the silver dots at the points of the scallops. I created the sentiment tage using the SU Word Window punch and I found a tip on Mary Fish's blog on how to get more use out of the SU Decorative Label punch. Mary has all kinds of videos on YouTube, they are called One Minute To Wow and does she ever WOW us with some very clever tips. Be sure to click on the link I left and check her out. To finish off the card I used SU dimensionals to pop up the Silhouette frame and the sentiment tag for a simply elegant birthday card. Come on over to the Quirky Crafts Challenge Blog for a fun challenge this week, you too could win some great digis and a Guest Designer spot. Oh, I saw you were published in the latest Vamp Stamp News--the September 2011 issue--that's a really neat art book you entered! I just love this silhouette beauty! The embossing really sets the framed image off so nicely! Gorgeous! Love its simple elegance. That digi is fantastic! This is very classy Beverly! Love the black & white theme and the embossing looks great!